It’s been quite a while since my last contribution to this blog, but I thought it would be fun to tailor the content of my first post in two months to Frank & Oak’s innovative marketing strategy. For those of you unaware of the brand, Frank & Oak is a successful online retail business, leveraging the power of social media, email marketing, and an effective easy-to-use website to go from nowhere to $6+ million in sales within a year. I’ve been following the brand ever since I first heard of them back in September, and they have inspired me to approach online marketing in a different fashion. As I become more immersed in developing membership marketing programs for online retails clients as part of my work, I thought I would give a nod to Frank & Oak and provide a detailed analysis of how they got me to purchase from their site four times within the past two months. Not only are these banners clean and succinct, they use the price point of their collection to their advantage by getting the casual male shopper interested. 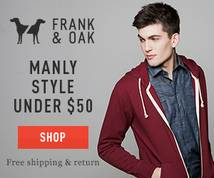 The higher the price point, the more reticent casual users, particularly the younger male audience, will be in checking out a retail site However, Frank & Oak exhibits different styles (dress, casual, and hip) to pull in a wide range of users. “Fresh Threads Under $50” has become a phrase that I easily associate with the brand, and has become crucial in pushing me over the edge to viewing their collections. I also took advantage of several other specials, including their most recent winter sale where some products were discounted up to as much as 50%. Their end of year sale at the end of 2012 was another offer that pulled me in, simply because it provides new users with a way to get into the door and become accustomed to the clothing. 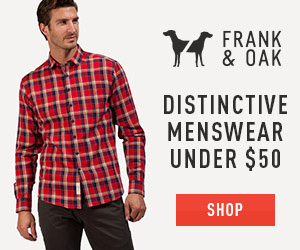 As a result, I eagerly anticipate every email containing an offer from Frank & Oak. Their email layout is stylish, simplistic, and efficacious in driving members to the site and to market their latest threads. Once again, this is an area the brand excels in for two reasons: (1) community marketing and (2) social referrals. Their community marketing is spread out across Facebook, Twitter, Instagram (they do have a Pinterest profile, but it remains largely inactive). On a weekly basis, the brand will hold “Necktie Friday” contests, encouraging users to share their photos across these three social media channels in the hope of winning a prize. Their customer support staff is also quick to respond, particular on Twitter where they have one separate account solely dedicated to resolving complaints. In fact, I took to Twitter one time to air my disapproval with an order fulfilled in late December, where I received the wrong polo and a defective dress shirt (a button fell off rather easily). Fortunately, the situation was resolved within the hour: this is proof that social media can be critical in maintaining existing customer relationships, and can be leveraged as a powerful customer service tool. Not only does this help bring in new members through a cost-effective model, it also increases the brand’s exposure on social channels. The easy-to-click social sharing buttons also make it relatively simple for active social media users to spread the word about Frank & Oak. In some cases, appealing to influencers will provide tremendous upside for the brand. For every referral who purchases, Frank & Oak makes more money on the initial acquisition of the original fan. Despite all of their marketing efforts via display advertising & re-targeting email, and social media, all would be for naught without a website to match. The new era of Internet marketing is ushering in a movement of simplistic websites that sacrifice unnecessary aesthetics for an easy user interface and powerful marketing message. Frank & Oak has capitalized on this movement by developing what I now use as my ideal model for e-commerce websites (lacking search functionality notwithstanding). High-res product shots, clean catalog overviews, and an effective quick “add to cart” functionality make the shopping experience easy and free of any headaches. Frank & Oak also invites users to get acquainted with the brand and its “curators”. Additionally, with each new collection, inspiring and innovative content is uploaded every month to provide users with fresh articles and insight into the brand. This type of dedication to providing unique monthly content makes the entire experience of shopping on the site a pleasant one indeed. The above is merely a quick summation of how effective the Frank & Oak online marketing strategy is; of course, I could indubitably write a series of blog posts covering every facet of the website (including the Hunt Club, which deserves a dedicated post on its own). Evidently, this Montreal startup has changed my way of thinking on certain element of online marketing, particular with regards to the effectiveness of email marketing. Prior to becoming a member of Frank & Oak, I had my doubts about the efficacy of email campaigns. However, a uniquely tailored campaign can become invaluable to an entire re-marketing program, and as a result, I have incorporated that line of thinking into my own strategies that I develop for clients. Frank & Oak is the ideal case study for new companies trying to make an impact in a cluttered online world. Marketing strategies cannot be, for lack of a better term, “half-assed”. Investing in a sound strategy that incorporates multiple elements will not only help you drive traffic and increase members, but will also play a key role in cultivating long-term relationships that increase the overall customer lifetime value. Now if you excuse me, I have some shopping to do…. Not sure if that qualifies as a case study on LCV but it sure is a good read on Frank & Oak. What would be interesting to know is what ratio of sales come from new users vs returning customers to evaluate their LCV and the velocity of their growth. Agreed – without any definitive stats regarding sales, it’s impossible to do a comprehensive case study, but it’s a good example of how to effectively manage an ecommerce store in this day and age.